So much yarn, so little time. : Getting noticed... wear a big hat? I don't know about you, but sometimes my online shops seem to be wearing a cloak of invisibility. I blogged a while back about Waggleforce and Project Wonderful - plenty of ideas there about getting your name out - but today I want to suggest adding a signature to your emails. It's EASY, really really EASY - and it's free. Everyone I email (yes, even the guy who gave me a quote for a roof repair!) gets my website address and an invitation to sign up for my newsletter - you can put whatever you wish. It's possible to include pictures, but many recipients will have blocked them as part of their security protocol, so in my opinion it's better to stick with text. 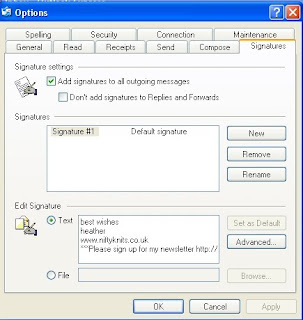 I use Outlook Express - at the top of the page there is a menu. Choose Tools, then Options, then Signatures. click "new" on the right, then "text" and type in whatever you wish to say. 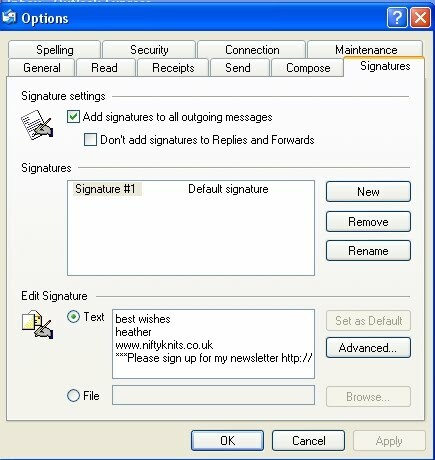 If you have more than one person using the email account you will need to click the "Advanced" button and tick the account for which you wish the signature applied. If you'd rather use a picture signature - maybe your online shop banner - I will blog about that tomorrow. In the google mail web client, it's under "Settings" (that link is int he top right of the screen), and then some way down the screen you get to (the "General" tab). Google mail will automatically at a line with "--" in it between the email you wrote, and the signature you add there. In Thunderbird v. 3 it's also easy to find: Click the "View settings for this account" option, and it's right on the first screen, too.